Il modo di fare impresa si sta evolvendo rapidamente sulla base dei cambiamenti globali. Qual è il ruolo dell’intelligenza emotiva nel Medio Oriente e in particolare all’interno del dinamico contesto di Dubai e della regione del GCC? In che modo l’intelligenza emotiva aiuta i leader a costruire imprese che si sviluppano negli Emirati Arabi Uniti e dintorni? Abbiamo approfondito con due esperti IE nel mondo del business l’uso degli strumenti forniti dall’intelligenza emotiva per migliorare le performance lavorative: Liana Bagworth è socia di Dynamic Learning, Preferred Partner Six Seconds a Dubai, Larisa Sohorca è consulente aziendale. L’intervista prosegue in lingua inglese. How do you help leaders leap across the accountability hurdle and lead differently? Liana: It is a good question. The company has expectations that leaders will produce certain results to move the company forward. So we don’t have to create that. When we help them realize that “emotions drive people, people drive performance” a light goes on. When they truly connect that the way they behave is what creates the environment in which their people are expected to perform, it gives them a place to look to be accountable. We often say we’d like a different outcome but we don’t see the path that will take us there. When leaders connect their own behavior and patterns to the results, and that they can do something intentional to get the different result, it puts them in a more powerful and engaged position. Being able to connect the dots using skills they already have and can further develop is the power that helps us help them leap! To engage leaders in EQ, show them: Emotions drive people, people drive performance. 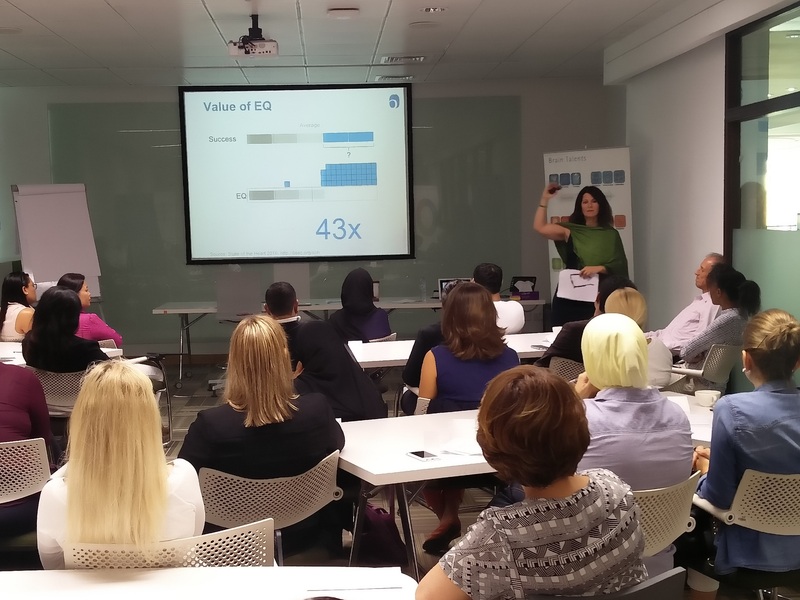 How does emotional intelligence in the Middle East become practical for business clients? We asked team members we work with to look at where blame comes from. For some, it was “I don’t want to take responsibility,” for others it was “I don’t want to take risks, I just want to make sure my job is o.k.” We asked them, “What is the impact if you keep on operating out of this framework of blame?” And that is when they become more mindful and intentional around the impact of having this pattern and therefore with the support of other productive patterns or EQ competencies, they are making a change. What about increasing trust? How do you get people pulling together? Liana: We have a client in that situation now. The senior team is ready and motivated but not working together. In a recent assessment of team effectiveness — Team Vital Signs (TVS) — trust and execution are very low. We saw the impact of this in the OVS. We showed them why their team and organization-wide retention is at risk. The TVS data helped to ground the leaders and establish awareness. The critical next step was to own the data. The C suite needed to know their behavior is causing the employee disengagement. Currently we are creating interventions that will help the C suite build trust and focus on their own engagement and teamwork. Data is not enough. Leaders need to OWN the metrics. So often, leadership was top down – is it changing in the Middle East? Liana: Yes. I experience more and more that employees want to be accountable and responsible partners in the company’s success instead of just being told what to do. We really see the emergence and power of the emotional connection to the organization. If you have people wanting to be engaged, it’s not enough to just come into work and tell them what to do. Do you find certain sectors are more receptive to focus on people-performance? Larisa: Our ability at Dynamic Learning is to customize programs for people. That’s what makes each of these industries equally interested and involved. If you are in customer facing sectors, your main focus is on customers, you want everything to be translated into the guest/customer experience. If you have for instance, an industry that focuses on production and may be more technical, we focus on the ROI, linking people’s performance with the strategies and outcomes desired by the organisation. It’s all about the effectiveness. I think that every single industry we have worked with has been receptive and has identified Emotional Intelligence as a catalyst for people development and performance. And the way we use the Six Seconds tools is to make sure we are aligned with the outcomes that our clients desire. Is there a critical mass that business leaders reach when it will become more normal to have engaged and empathetic leaders? Liana: We have to get to that point, the world demands it. We are so connected today. People around the world conducting business and teaching each other, bridging geographical difference seamlessly. Our world is more informed and more enabled, and that is fully translating into the workplace. Leaders are realizing it’s a different game. It’s troubling that over the past 6 years, measured EQ is declining globally, especially empathy. EQ research, the publications, the fact that EQ is science-based and measurable, and that there are tools that give you statistical significance to outcomes is making the difference and will help create more engaged and empathetic leaders. Emotional intelligence has a direct impact on customers. Help leaders connect the dots. 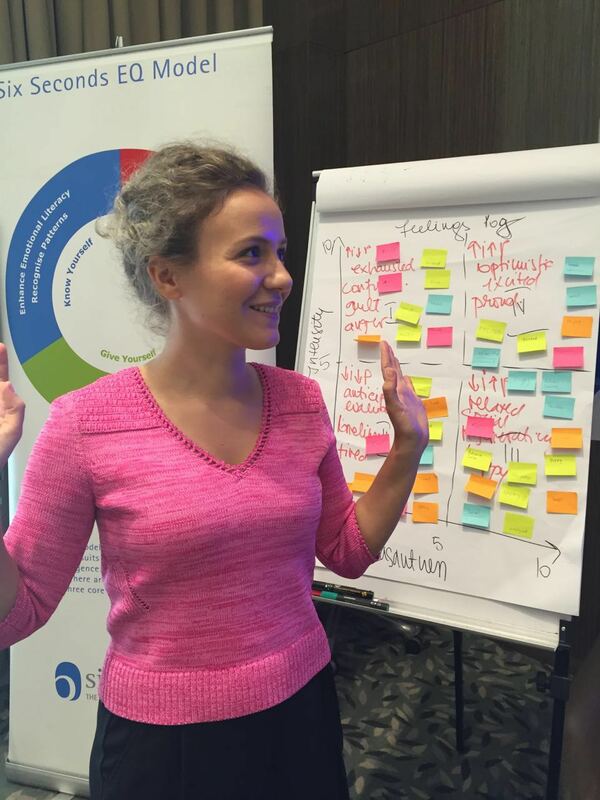 Working in Dubai: How is emotional intelligence accepted? Liana: I’ve worked in Africa, North America, and across the Middle East – leaders at the heart of it face the same issues: do they have the right, motivated employees focused on the doing the right thing at the right time to get the right results? Yes, there are cultural flavors to respect. In the Middle East they are perhaps a few years behind North America in some business management and leadership practices but they are learning quickly. The vast majority of the business we do is with national companies. The non-national companies bring their practices from the mother ship back home in North America, the UK or Europe. They may well have been using EQ for 5+ years now. The national companies are embracing EQ and using it competitively, jumping over the lagging decade and right into 2016. What’s next for emotional intelligence in the Middle East? Larisa: I am all about building on strengths. One great opportunity is to get people more exposed to self-awareness. People are very strong at making decisions, and it’s great when, during EQ workshops and coaching sessions, they pause and explore more the area of “Know Yourself” which is all about self-awareness. I would like to be able to develop more work around three specific competencies: recognize patterns, consequential thinking and increase empathy. I can see how they can impact the success factors predicted by EQ. How did you get involved with the Six Seconds Emotional Intelligence Network? Liana: Several years ago I met a preferred partner, Carolyn Meacher, through mutual friends. She was telling me about Six Seconds, I was about to start working with a neuroscience research and development lab, and it piqued my interest. Several months later we got Josh to Toronto and ran a practitioner’s certification, and it kept going from there. In 2014 took two certification courses in Dubai with Jayne Morrison. I continued using the 6S tools in my own practice. Jayne and I began an association and then started working together in Dubai in August 2015. Now I am her co-partner in Dynamic Learning and we are the largest Preferred Partner in the network. It is working out well. What emotional intelligence tests do you use? Liana: We love Six Seconds’ slate of tools, especially the Vital Signs assessments. Either the Leadership Vital Signs or the Six Seconds Emotional Intelligence test is built into our coaching engagement and leader/employee development. We ground everyone in their own EQ. We use Organizational Vital Signs and Team Vital Signs when we support organizations going through major change. It allows us to measure the effect of their current leadership on creating the climate and therefore employee engagement and performance. As their support partners, this data also enables us to design and deliver the most strategic interventions for the organization and to best support the change agents in leading the change. We are using the Brain Profiles more, and finding creative ways to realize the potential there. What’s ahead for Dynamic Learning? Liana: We’re excited to grow our consulting work – big strategic projects like culture transformation and developing competency frameworks and assessments. Using the tools’ algorithms as measurements and embedding them in the people management streams. We are excited to work with the new predictive analytics, Neural Network and the HR suite of reports. We are negotiating strategic partnerships with large management consulting firms, providing them with the “secret ingredient” in measuring and developing change agents to support their business transformation strategies.